My children love craft projects and recently my little boy was fascinated by all things related to butterflies...so we decided to make stained glass butterflies to put up in the kitchen windows. We made these just like the stained glass crosses we made back in March--which still are up in the windows and looking beautiful! 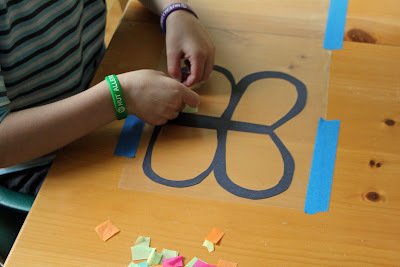 First I cut out an outline of a butterfly out of black construction paper and adhered it to clear contact paper--I taped that down (sticky side up!) to the kitchen table so that it wouldn't move while my son worked on his project. 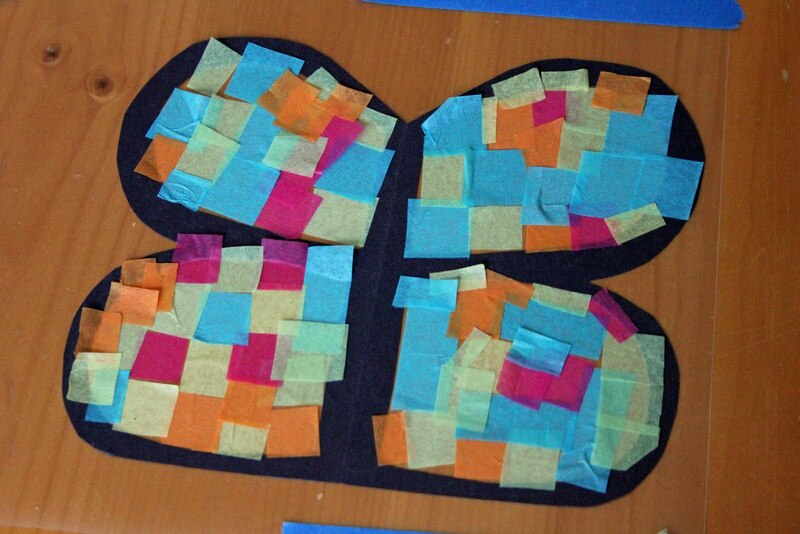 He filled the butterfly with squares of tissue paper. 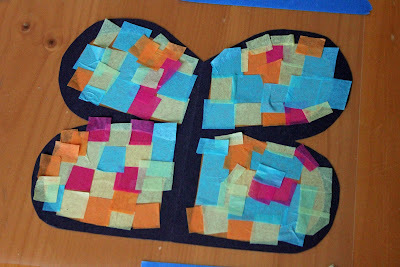 When he was done, I put another black butterfly outline over the top (to hide the tissue paper edges) and then covered the top with another layer of contact paper. At this point the butterfly is sandwiched between the contact paper. 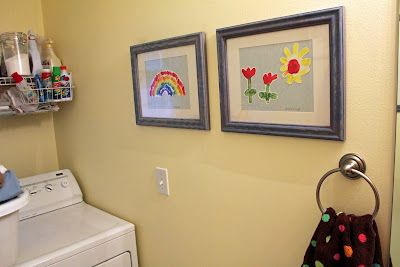 Then I trimmed the excess contact paper off and the project was done! 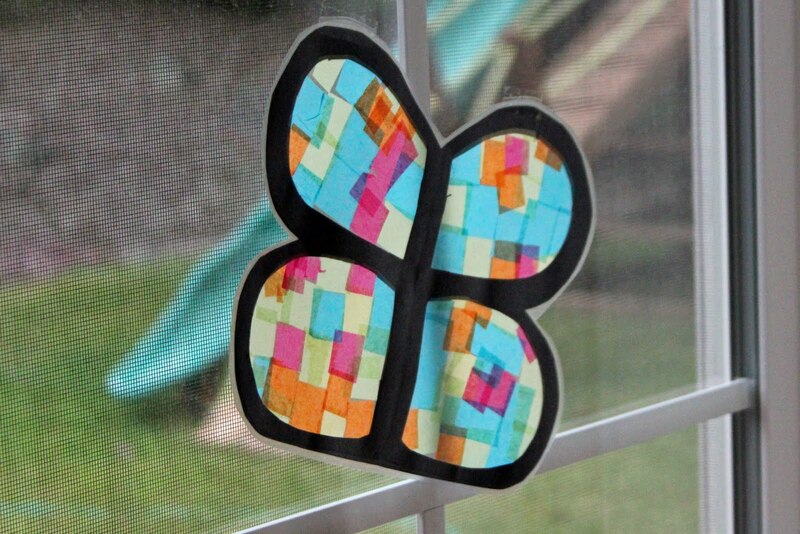 His butterfly is a bright and colorful addition to our window--perfect for summer! The 4th of July is just around the corner! I don't go all out decorating for this holiday, but I do like to have a few patriotic touches out in the house. 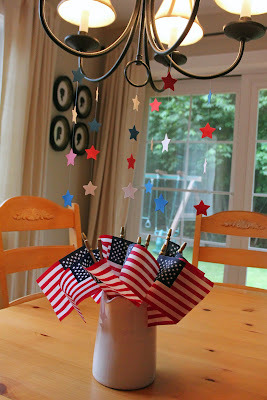 I fill my white pitcher with American flags and, this year, I glued red, white, and blue stars (punched out of scrapbook paper) onto clear thread that I tied onto the light fixture above our table. The thread is sandwiched between two stars. 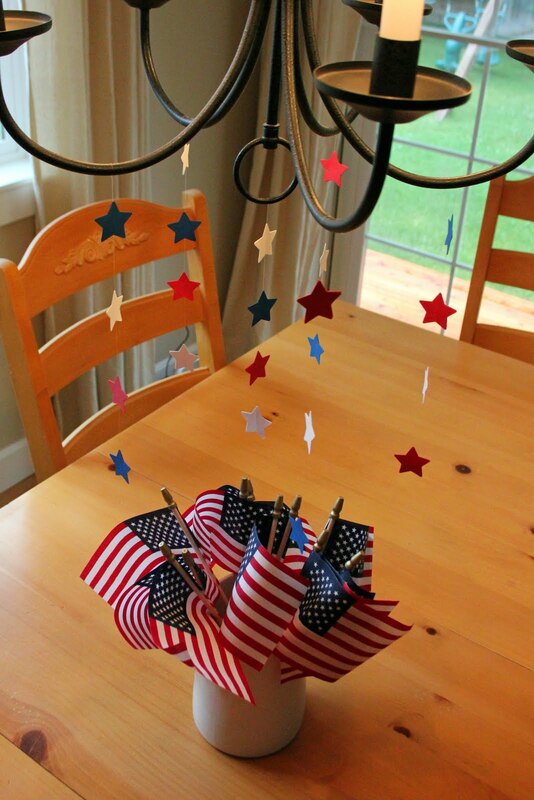 This "shower of stars" is a simple and inexpensive way to add a touch of patriotic flavor to our summer decor. School ended Friday (finally!) so today I made a summer to-do list with my children. After I reigned in their expectations a bit (no out-of-state trips or overnights at Great Wolf Lodge), we had a lot of fun. They came up with a lot of ideas all on their own, but still cheered at some of my simple suggestions. 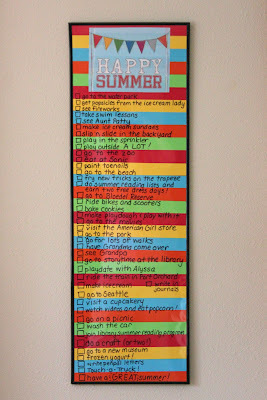 Now that it is hanging on the wall, they like to look at the list and tell each other "Wow, we are going to have a fun summer!" I'm not original in coming up with this idea, by any means, but here is how I did it. I bought a poster frame at Michaels--with a 40% off coupon it came to around $5. 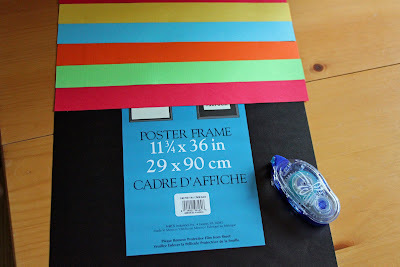 Then I cut five pieces of scrapbook paper into 1.25 inch strips and used scrapbook adhesive to stick the strips directly to the paper that came in the poster frame. Once the entire piece of paper was covered, I trimmed off the excess paper. So simple! 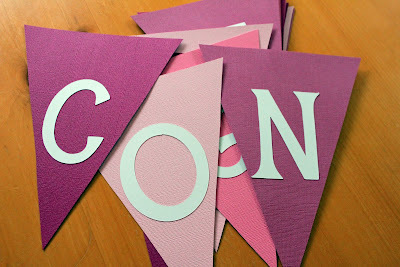 For the "Happy Summer" pennant print that you see at the top of our list, I used this printable that I found at The Rubber Punkin and just cut it down a bit. I wrote our list directly on the glass/plastic on the front of the frame with a Sharpie. It comes off with Windex and a bit of scrubbing (I tested it). whatever ~ this one makes me crave an old-fashioned green chalkboard! Laura Winslow ~ this one is done for you--just print it! 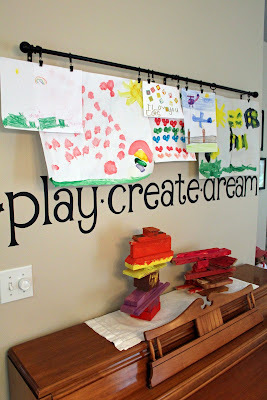 101 ideas for summer fun! eighteen25 ~ these ladies always have something going on, and this is no exception! 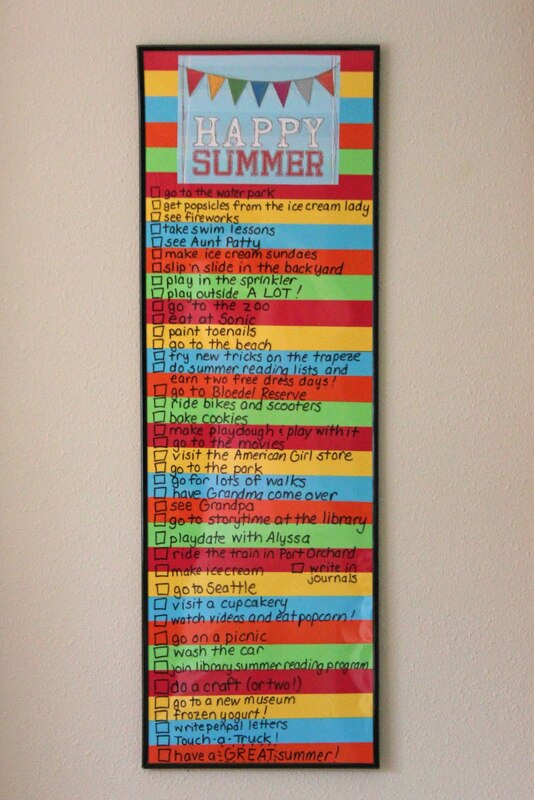 Sunny Side Up ~ Erin's list is on poster board and is cute, colorful, and full of summer fun! I think my husband had a good Father's Day--he smiled a lot, at any rate! The children made him (with my help) a handprint tie and they were so proud when he wore it to Mass. They have also insisted that he wear it to work on Monday. I think this will be the first time he has worn a tie to the office! I found the tie idea on The Littlest Crafter and loved it! 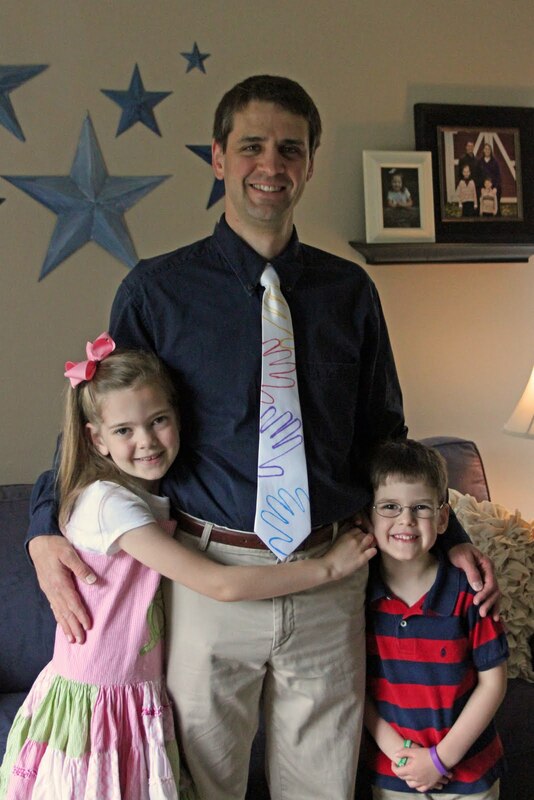 Basically you just take a white tie and use fabric markers (mine are Crayola brand and I bought them at Michaels) to trace your children's handprints on the tie. Easy-peasy! 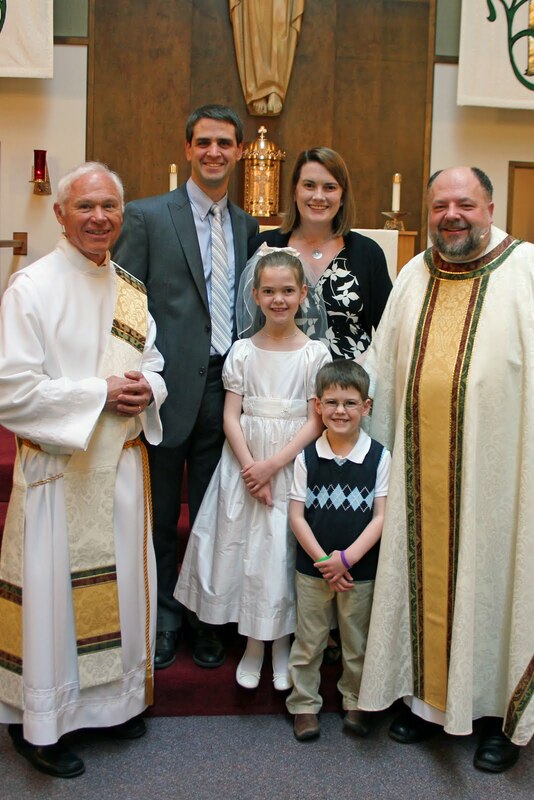 We went to Mass in the morning (and brought Father David cookies and Father's Day cards--he loved them!) and then out to lunch. After lunch my husband finally had time to thoroughly look at more of his gift. I had each child fill out an interview form that I printed out from Big D & Me and they had some great answers. Apparently my husband is 9.5 feet tall and is robbing the cradle because he is 4000 years old! 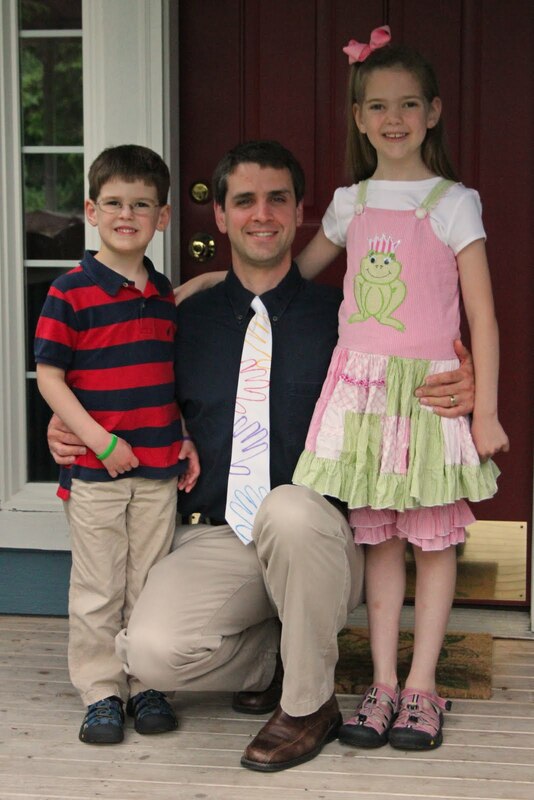 Happy Dada Day (as we say in our house!) to all the fathers out there! 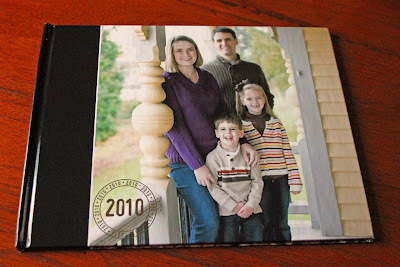 I love to scrapbook, but I am behind. Dreadfully behind. So behind that it feels as though I have a giant snowball rolling along behind me that is going to crush me soon. 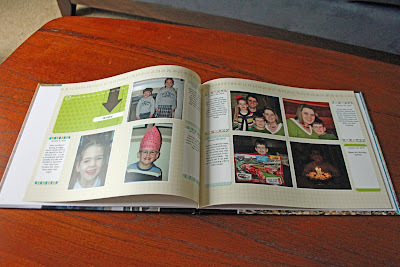 In fact, I'm not quite sure I still can say that "I love to scrapbook" but rather that I love the idea of scrapbooking. 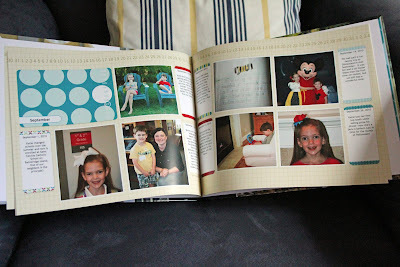 Truth be told, the idea of catching up on all my scrapbooking is overwhelming and daunting! I have the supplies, I have oodles of digital pictures, but I do not have the time! 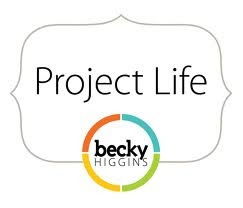 Enter Project Life by Becky Higgins. 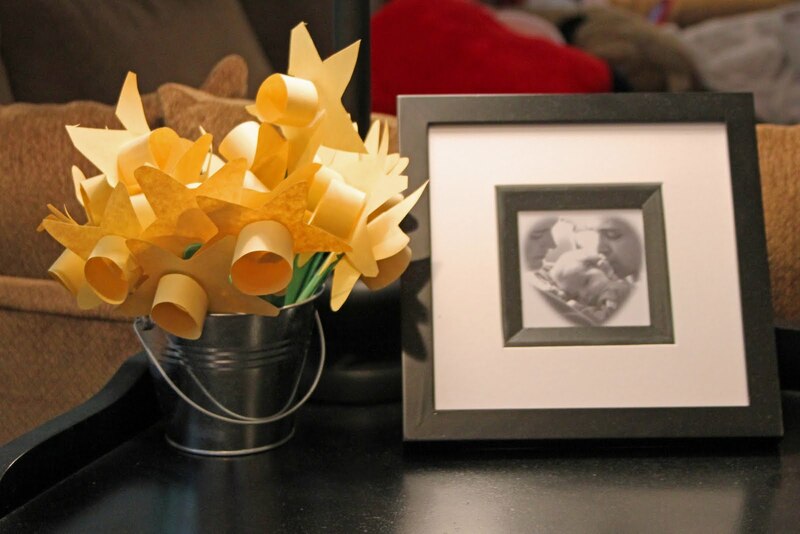 Basically it is scrapbooking made simple--putting the focus on the pictures rather than on all the finicky crafting supplies. You can do it in a picture a day format (the 365 projects a lot of people do) or in your own format. Then--THEN--I saw a video Becky Higgins posted on her Facebook page. That video is what made me realize I can love scrapbooking again. I can keep up with my pictures and not be years and years behind. I can scrapbook and use doo-dads...or not. It is totally up to me! I am NOT a digital scrapbooker. Not. However, even I was able to make a digital yearbook (easily!!) for my family and it is beautiful. Seriously, BEAUTIFUL. Now I can make digital yearbooks for each year and save my paper scrapbooking for major family vacations or our Christmas album and not worry about scrapping every family moment. Look at that beautiful book! 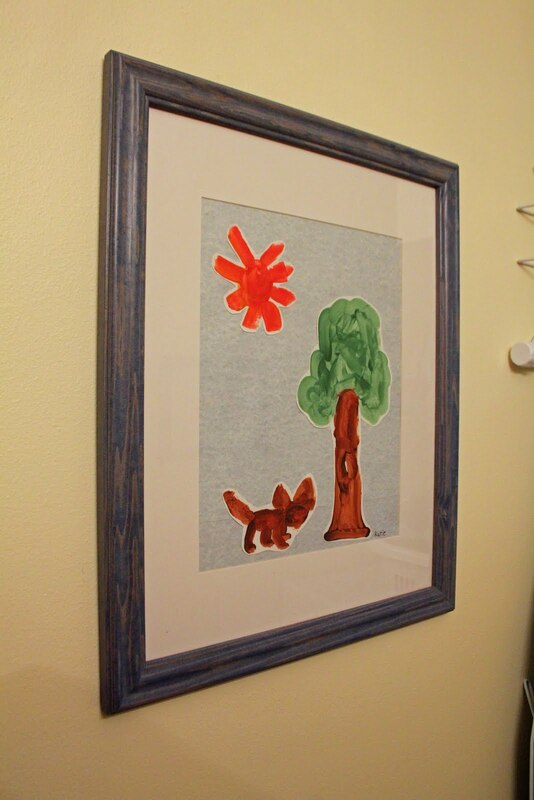 I was able to customize pretty much anything I wanted on it--and could have done even more than I did. LOVE it. (Don't mind my finger...just covering up our last name...) The printing in this book is so lovely. 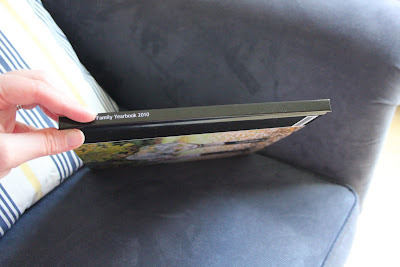 Everything is crisp and the pages have a great weight to them. Here is the month of January, complete with journaling! 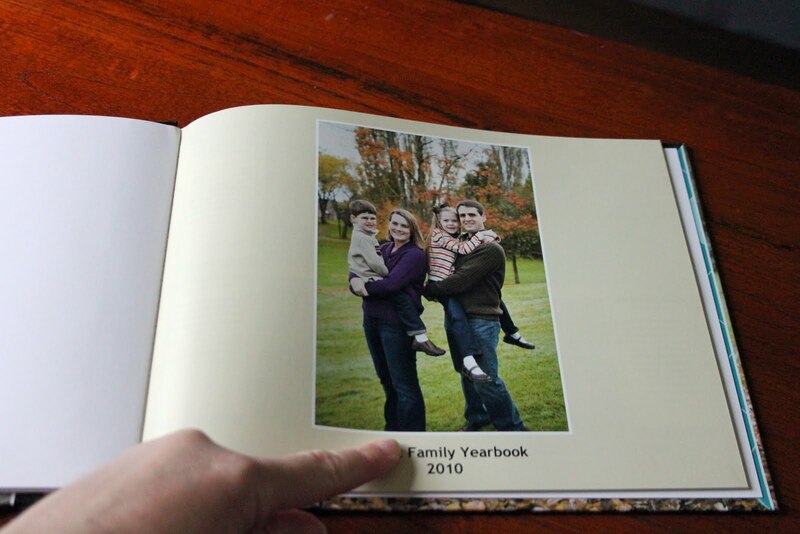 I thought it would be difficult to select just seven pictures, but it really wasn't...by the end of this book I really felt as though this gave an excellent picture of our year. I did these monthly pages pretty much using the existing templates, but you can toss the templates and just cover the pages with pictures if that is your choice. 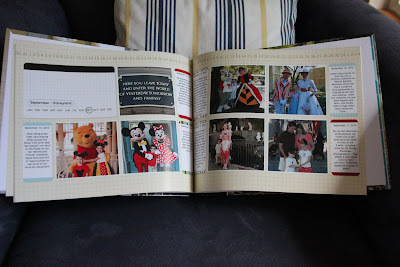 In September we went to Disneyland--here is the regular monthly layout for September. This was the first month where I felt as though I couldn't summarize our month in just seven pictures...so I added some extra pages! Here are the Disneyland pages I added right after the September monthly pages. I still plan to do another traditional paper scrapbook for our trip, but I like seeing the trip represented in this yearbook, too. I covered up the last page that was in the album with more of our own pictures--this album is so easy to customize! 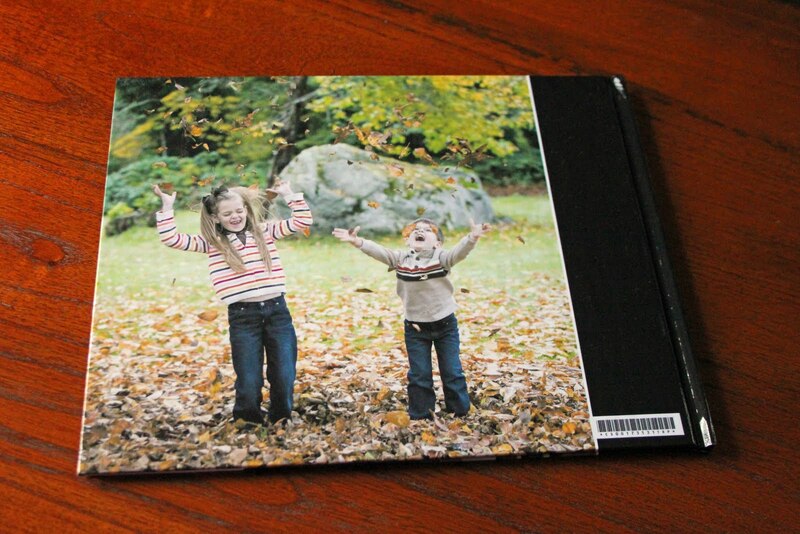 Even the back cover has a full color picture of my babies (yes, they're tossing leaves into the air)! And of course the title is on the spine of the book--I'm already looking forward to having a whole row of these yearbooks lined up on our shelf. This yearbook is called "Digital Project Life" on Becky Higgins' site and Facebook page. 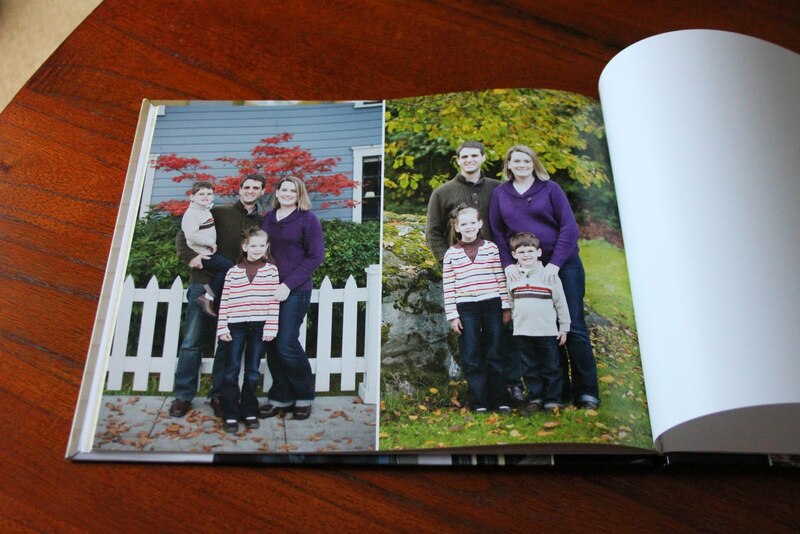 You can make an entire book and preview it before you pay anything--this is what I did...however I loved the end result so much that I ordered three of them. 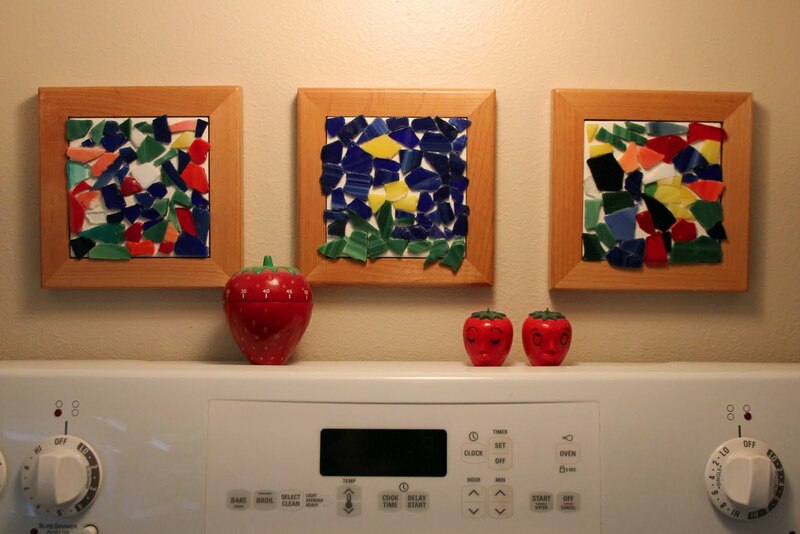 One for each of my children and one for me to keep. I shared the finished book with my children last night as they were finishing their dinner--I treated it like storytime. It was so fun to see their faces light up as the pictures sparked various memories. This is something that NEVER happened with the digital pictures all closed up in my computer and the bins and bins of unused scrapbooking supplies. It feels SO GOOD to have my family enjoying these memories because that is what scrapbooking truly is about--it isn't about cutting and pasting and fancy fonts. 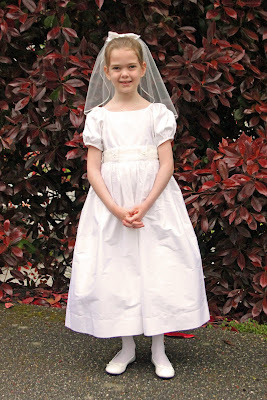 Last month my daughter celebrated her First Holy Communion. 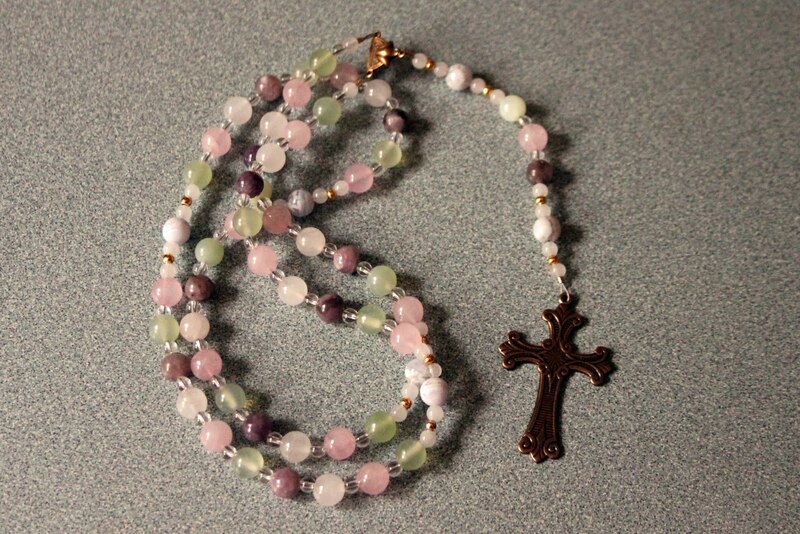 She was doubly blessed because she celebrated twice! Of course only one was truly her "first" First Communion, but she wore her white garments for both. Our parish priest celebrated the First Communion Mass and he is the same one who baptized her, so that made it extra special. She did a good job with the big chalice, too! The following weekend, her school had their First Communion celebration and she was invited to celebrate again with her classmates in that parish. Although it was still a Catholic Mass, it was a very different sort of celebration (it was a dedicated First Communion Mass rather than having the celebration integrated into the regular Mass the way our parish does it) so it was interesting to see the differences. My sweet girl looked beautiful on her special day. She wore a silk dupioni dress from Strasburg Children and I had her veil custom made by the woman who made my wedding veil. 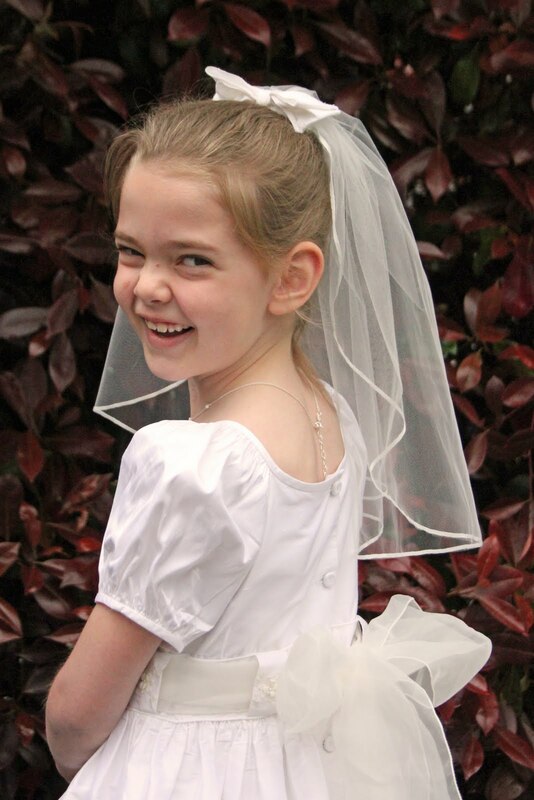 It is a child-size version of my wedding veil. 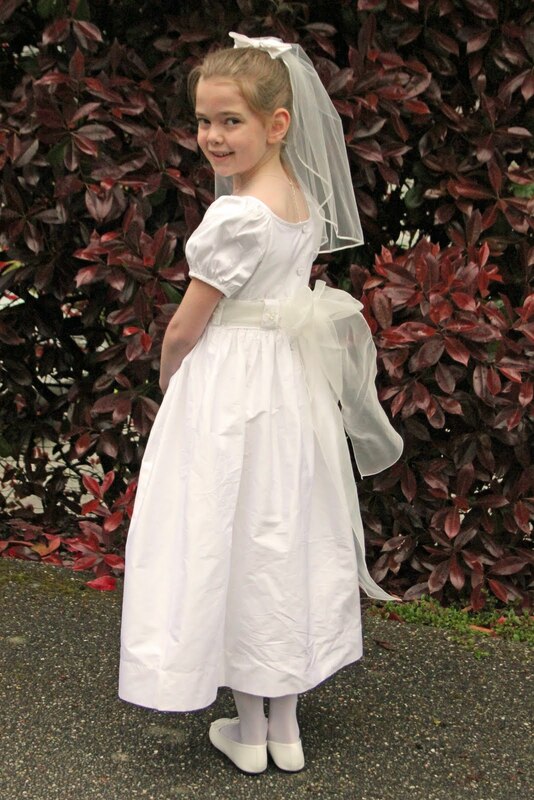 Perfect for my bow-loving little girl who really really wanted to wear Mama's veil (that was too big and that was the wrong shade of white). I bought her this beautiful rosary from Etsy...and, my favorite, a beautiful little clay bowl to keep it in. This bowl is gorgeous and was packaged SO beautifully! It is personalized for my daughter so I can't show the details, but click over to Etsy to look at the shop for Clarey Clayworks. 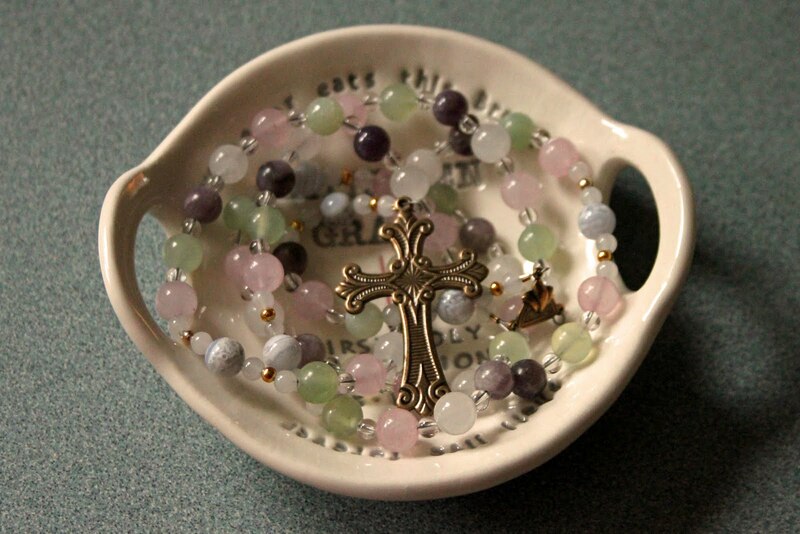 They make beautiful bowls for all sorts of occasions and will personalize them. It is just lovely and perfectly holds her new rosary. Two years ago I blogged about some adorable OKAb shoes that I bought. I still love those shoes...but last week I looked down at my shoes and realized that the sole of one of them was ripping in half! Not a good look. I crossed my fingers and hoped that my shoes would last until I made it home (they did) and promptly went online and ordered myself some new shoes. The verdict? I'm in love! I had no idea Teva made mary janes, but I love these! 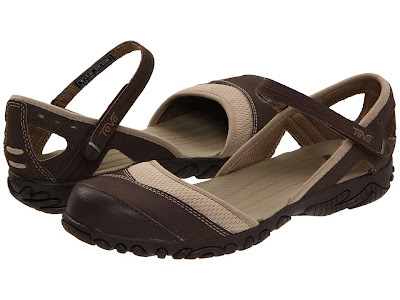 The style is the Teva Westwater 2. 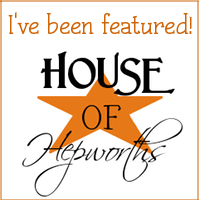 They are perfect for running around after my children and for my lifestyle. They run about a half a size or more big (I read lots of reviews that referenced this and my experience backs this up). However, I have BIG feet and these do not make my feet look big...and I love that! 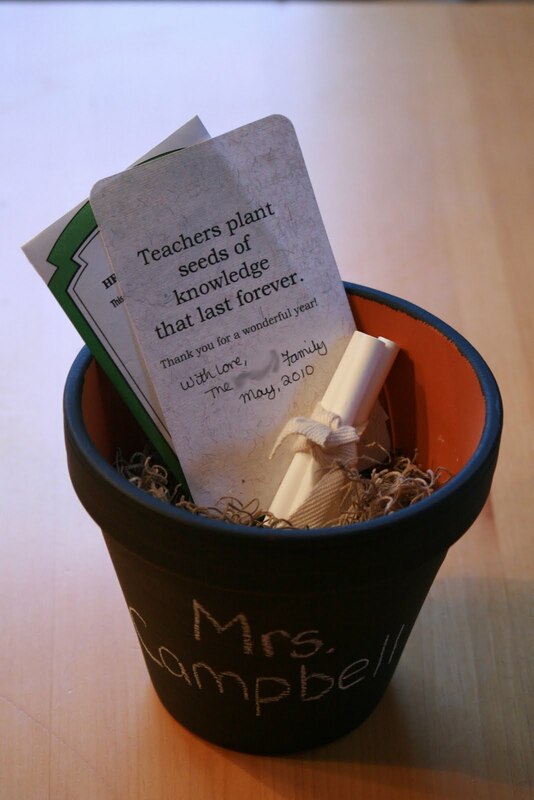 It's that time of year again...the school year is winding down and it is time to let my daughter's teacher know that I appreciate the time and love she has put into teaching my little girl this year. Last year I painted terracotta pots with chalkboard paint and added a little bundle of chalk (tied with twine) plus some packets of herb seeds and a nice little quote. I had my child write a note to the teacher on the back of the note and it made a nice gift that didn't break the bank and that was, I hope, usable for the teacher. Perhaps we'll do the same thing this year since we've changed schools...hmm...my wheels still are turning on this one! We recently celebrated my daughter's First Holy Communion and I wanted a simple "Congratulations" banner to hang for the occasion. 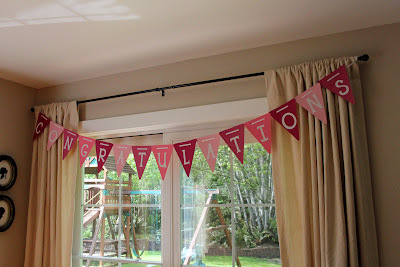 I made this banner out of scrapbook paper and grosgrain ribbon in an afternoon. I opted to make a very simple banner, but it could be embellished to be as fancy as you would like it to be. Cut out your triangles--however many you need for your banner. I needed fifteen to spell out my word. Cut out your letters. 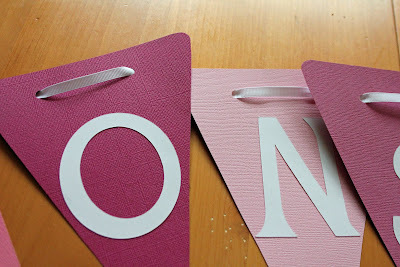 I used my Cricut to cut mine out, but you could use any sort of craft cutter or even use letter stickers (from the scrapbook section of the craft store), a stencil, or just use a marker. 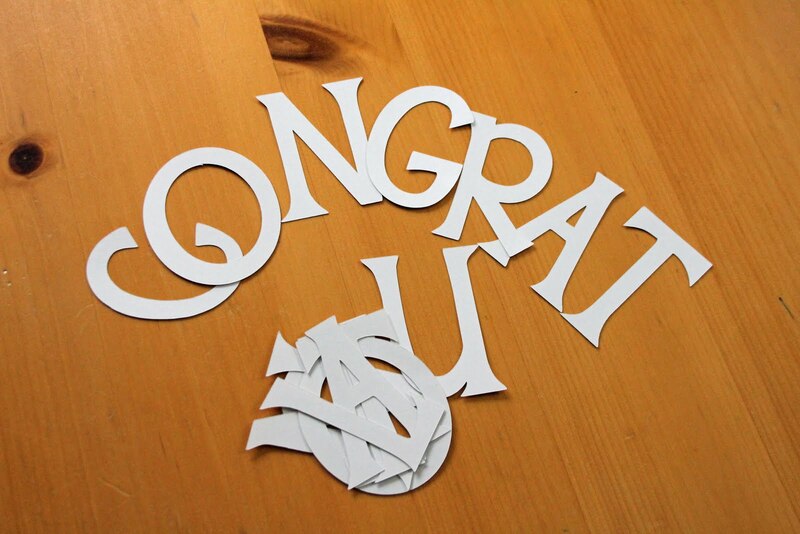 Adhere your letters to the pennants. I used scrapbooking adhesive (a tape runner) for this step, but you could use a glue stick or whatever you have handy. 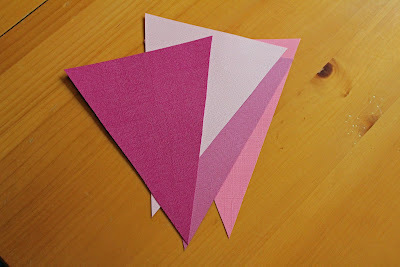 This step is skippable, but I'm addicted to my corner rounding punch, so I used that on the corners of each pennant. Here you can see that I used it on the "C" but hadn't yet used it on the "O". I think it just gives my simple banner a nice finishing touch. Very skippable though if you don't have this punch. 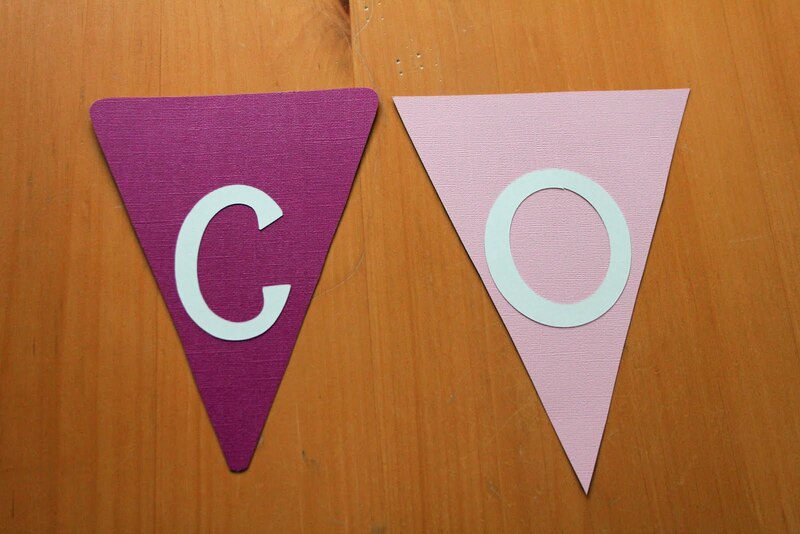 Punch two holes in the top of each of your triangles and thread your banner! 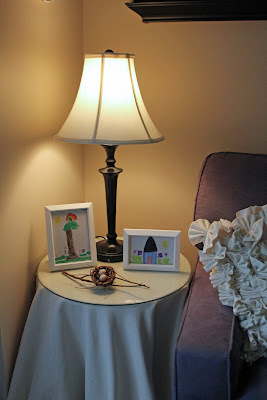 Use ribbon, twine, yarn--whatever looks best! 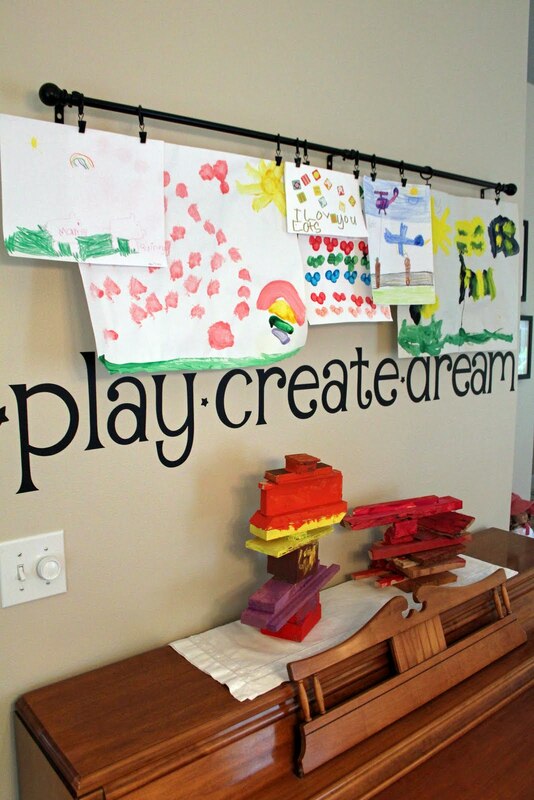 Hang your banner and admire your creation!